Wrestling has long been a strong sport in the area and boasts some of the best grapplers in not just the region, but the entire state. 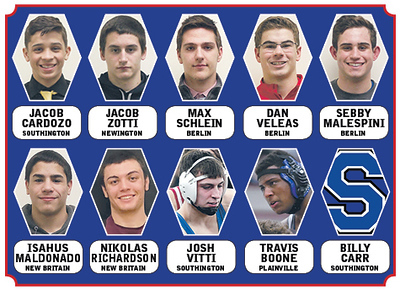 Although there were plenty of exceptional athletes to choose from, our 2018-19 All-Herald Wrestling Team reflects the best of the best. The top 10 on our team have shown the ability to dominate the competition at every level. Jacob Cardozo followed up an outstanding junior campaign with an even better senior season. Jumping up in weight class from 126 to 145 pounds, Cardozo rolled through his competition. The Blue Knight won the Class LL championship, beating Fairfield Warde’s Cole Shaughnessy in a 3-2 decision, and later took fifth at the State Open. He also competed at the New England Championships. Billy Carr makes his first appearance on our team and shined for Southington this season on the mat. The junior didn’t have much competition on his way to a Class LL title at 170 pounds after he beat Amity’s Andrew Seaton, 5-4. With another season to go, Carr appears to be in line for an even bigger senior year. Josh Vitti is the final Blue Knight on our All-Herald team and was just as consistent as his teammates. The junior placed third at the Class LL championships with a 7-2 decision over Danbury’s Tyrell Jones and later took fifth at the State Open, which qualified him a spot at the New England Championships. He will be a wrestler to keep an eye on next season as well. With a number of young grapplers in the lineup, Berlin had an up-and-down year this past season, but its veterans were excellent from the first match to the final tournament. No All-Herald team would be complete without the inclusion of Dan Veleas. The senior won his third Class M state championship, capturing the title at 145 pounds after beating Joel Barlow’s Alex Klein-Wassink in a 7-1 decision. Veleas was also a runner-up at the State Open and secured a spot at the New England Championships. For the season, Veleas finished with a 43-6 record and went 139-36 in his career. He was also named to the All-State, all-CCC, All-State Academic and all-conference academic teams. As such, Veleas is also a strong student in the classroom and a member of the National Honor Society. He will a tough wrestler for Berlin to replace next season. This was just Sebby Malespini’s second season as a high school wrestler, but he certainly didn’t show it. The senior went 34-5 this past season and placed third at the Class M championships with a 5-3 win over New Fairfield’s Colman Doucette in the 170-pound weight class. Malespini also won his bracket at the Eagle Classic tournament, placed second at the CT Challenge in Southington and C.J. McCormack Tournament and took third at the Bristol Central Invitational. A strong student as well, Malespini has a 3.9 GPA, is a high-honors student and a member of the National Honor Society. He plans on attending UConn in the fall. Max Schlein is the third Berlin senior to make our team. After losing a portion of his junior season to a shoulder injury, the senior turned in an outstanding senior campaign. Schlein went 25-5, which included a win at the C.J. McCormack Tournament. He also placed second at the Class M championships at 220 pounds and competed in the State Open before another injury forced him to withdraw. Schlein was an all-conference selection and plans on attending the United States Naval Academy for college if accepted by the school. New Britain continued to show it was a program on the rise this season and places two on our team. Isahus Maldonado turned in a strong senior year for the Hurricanes and was one of the program’s most consistent grapplers. He finished the season with a 29-12 record and placed sixth at the Class LL championships at 106 pounds. Maldonado also qualified for the State Open and was awarded with an All-State selection. The wrestling captain is just as successful away from the mat. Maldonado is a high-honors student and is the clarinet section leader for the high school’s marching band. He would like to keep wrestling in college. Nikolas Richardson was another wrestler who did well for New Britain this season. The senior placed fourth at the Class LL championships and reached the State Open. As part of a senior class that helped put the Hurricanes on the upswing, he will be a tough presence for head coach Jordan Jacquo to replace next year. Newington is another program that is trying to build itself up, and with wrestlers like Jacob Zotti, the Indians are well on their way. He had a strong junior season, going 28-13 on the mat. In the postseason, Zotti placed sixth in both the Class L championships and at the State Open in the 132-pound weight class. For his efforts, Zotti earned his third straight all-CCC honor. Plainville surprised a number of people throughout the regular season and in the state tournament, and Travis Boone was a key reason why. The senior was exceptional this year. He placed fifth in the 220-pound bracket at the Class S championships after he pinned Gilbert’s Bajrum Gutic in 4:56 and earned a spot to the State Open, where he reached the consolation bracket. He is going to be missed by Plainville next season. Posted in New Britain Herald, Berlin, Goodwin Tech, Innovation, New Britain, Newington, Plainville, Southington on Friday, 5 April 2019 20:53. Updated: Friday, 5 April 2019 20:56.